← New Year and good health! The New Forest ponies can cope with all sorts of weather conditions. I was checking my diary recently to see what I was doing this time last year. My diary isn’t a detailed chronology of events and on some days there are no entries at all. Strangely, this often means I’ve been too busy to fill it in. Interestingly, as I flick through the pages, going back in time as I do so, the one theme that is constant above all others is the weather. Even if I haven’t filled much else in, I have recorded what was going on weather-wise. Obsession with the weather is reckoned, of course, to be a British characteristic because we have so much of it. Unlike other countries that know tomorrow and the day after and even the day after that are going to be sunny, or who have a regular (almost arrive-on-time) rainy-seasons, we never really know what the weather is going to bring. Last year, for instance, varied hugely in rainfall, temperature, and sunshine. In February, we were struck by ‘The Beast from the East’. Plummeting temperatures and thick snowfall caused havoc for many parts of the country. Even the simplest task of wheel barrowing hay to our field-kept ponies became a job for our trusty 4X4 truck, as we simply couldn’t barrow the hay up the hill. 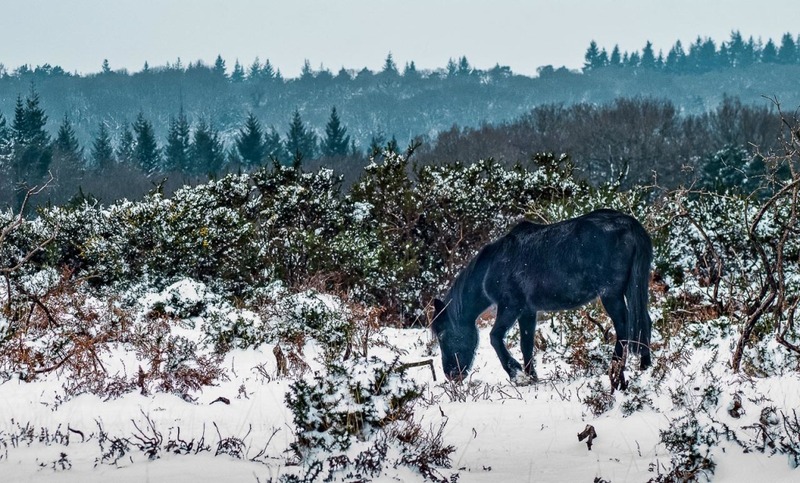 For our ponies roaming the New Forest, they were able to find places to tuck out of the biting winds and, while the ground was covered with a layer of snow, were able to eat the gorse that grows so widely there. Gorse is a member of the pea family and is highly nutritious, though somewhat prickly, to eat. Most people think that ponies eat just grass (because generally horses and ponies are kept in paddocks) when, in fact, if left free to roam their diet is considerably varied taking in all sorts of vegetation and herbage. Our free-roaming Forest ponies fared much better. The foals were born in the heat of May and their dams were able to feed on the vegetation sustained by the many wetland areas of the Forest. (Wetland restoration work in the New Forest has, as an added benefit, been improving the grazing considerably. Long may it continue.) The ponies know their territories intimately, and know when, where and how, to find food, water and shelter, even in the most extreme of circumstances. There was plenty of water out on the Open Forest, if you knew where to look. Well-meaning people, leaving buckets of water outside their properties for the ponies to drink from, nearly caused a serious welfare problem, because once the lead-mare has quenched her thirst she will not lead the herd to water. There were instances where the rest of the animals in the herd fought over dribbles of water left in the bucket or had to continue their thirst. Of course, leaving buckets of water, like putting out food, encourages the animals into developed areas where they are at risk of traffic. Of course in such extreme conditions one hears the inevitable accusation that the New Forest is being over-grazed. This is an issue that surfaces every now and again. Commoner’s animals have been grazing the New Forest since before the Norman Conquest and this is the reason they are referred to as ‘the architects of the Forest’ because their grazing, footfall, and dunging maintains and shapes the landscape. Many of the habitats that are vital for a diversity of species, including plants, fungi, insects and invertebrates, rely upon the free-roaming habits of the ponies to maintain them. If the Forest was overgrazed our animals would be starving – and they’re not. 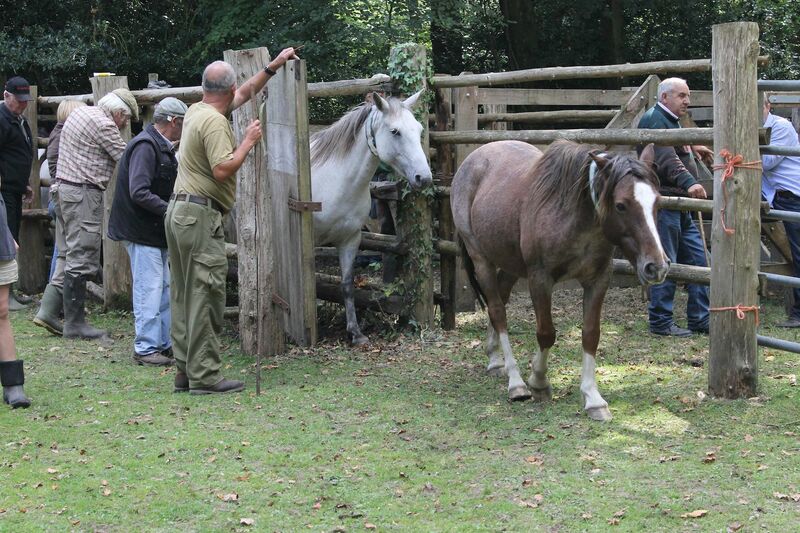 A twice-yearly check, arranged by the Verderers of the New Forest, accompanied by animal welfare organisations, such as the RSPCA, British Horse Society, and the Donkey Sanctuary; as well as vets and DEFRA representatives, ensure that the welfare standards of our stock is maintained. The number of animals depastured on the New Forest has fluctuated over time (seen in decades) and, each time, one species or another of plant, insect, animal, or bird, has been able to take advantage of a change in conditions. It’s a natural part of the ebb and flow of Forest life that cannot be organised according to a scientific formula. The national and international designations that protect the New Forest’s fragile flora and fauna are monitored by statutory bodies, including Natural England, and organisations, such as Hampshire & Isle of Wight Wildlife Trust, who recognise the contribution commoning makes to the New Forest. However, some people have inaccurately used the Verderers’ marking register as a record of the number of animals actually depastured in the Forest and are claiming high numbers of animals are being turned out. Not all animals in the register are grazing in the New Forest. The Basic Payments Scheme requires farmers and commoners to present the marking fee receipt in order to qualify for basic payments on all animals. It’s difficult to know exactly how many animals are turned out at any one time. Some commoners only graze their animals for short periods or some of the time, such as in summer only. Commoning is not a one-size-fits-all type of farming. The facts are, that the New Forest pony is on the equine watchlist of the Rare Breeds Survival Trust, and the continuation of this native breed is crucial to the future of the New Forest landscape. In terms of threats though, the biggest threat to the New Forest, in common with us all, is climate change. If there were more areas like the New Forest with large areas of vegetation, wetland and trees, managed in the same way with free-roaming livestock, then perhaps we would not be experiencing the extremes that seem to be a developing feature of our weather systems. The practice of commoning, which has existed uninterrupted for over a thousand years, is still the dominant influence over the Forest’s ecology, economy and community. New Forest Commoners’ Defence Association: FAQ – Is the New Forest Overgrazed?